First Impression: Nowhere is the boom and excitement of suburban Cincinnati's fast-paced growth more evident than in Mason; its population has exploded since the early ‘90s - nearly tripling to 30,000 today - and is still growing. In turn, business and educational opportunities, government, housing and recreation have progressed at a dizzying place to keep up with this once largely rural farming area. New shopping centers, restaurants, upscale boutiques, salons, dozens of new subdivisions - and some rush hour and weekend traffic jams - have sprung up on the Northeast edge of Cincinnati in nearby Warren County. Second Look: According to CNN Money, the City of Mason is one of the top 100 places to live in the United States. 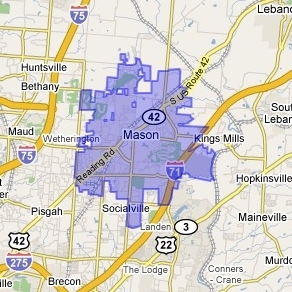 Large and expansive, Mason is quickly developing a reputation for offering healthy commerce, good schools, new homes and a modern lifestyle. Located off I-71, Mason lies between Northern Kentucky/Cincinnati International Airport and Dayton International Airport. Business is big in Mason, supporting many professional and management jobs, as well as a manufacturing base. Mason is home to 17 commerce parks and several more planned or under development, as well as three of Warren County's largest employers - Cintas, Luxottica Retail and the Procter & Gamble Health Research Center. Warren County is Ohio's second fastest growing county (only behind Delaware County, near Columbus), and Mason is the county's fastest growing city. In the trail of the economic boom a host of new residences and subdivisions are taking root. Among the most fantastic is the Long Cove development, which is minutes from I-71 and within walking distance of the new Deerfield Shopping Center and Regal Cinema development. Long Cove features multi-million dollar homes, a walking trail and small lake, and has repeatedly served as the site for the annual Homearama home show event. Mason also offers more affordable modern subdivisions in other areas, as well as a smaller selection of apartments and condos. Older, smaller homes can also be found clustered around the historic downtown area in the northern part of the city. Mason is a wonderful place for families and belongs to the highly rated Mason City, Kings Local and Lebanon City school districts. It's also known as a place to have fun; Mason boasts the region's best known theme park, Kings Island, as well as the newer Beach Water Park and Great Wolf Lodge and Conference Center. Recreation is also a top priority in Mason; the Tennis Masters Series draws world class men's and women's professional tennis every summer, bringing reputable players such as Andre Agassi, Serena Williams and Roger Federer. Mason also provides one of the region's largest community centers, which includes a fitness center, several gyms, indoor pools and place to eat, as well as an outdoor municipal pool and water park. Unlike many municipal community centers, these facilities are open to residents and non-residents alike. For entertainment, there's plenty to do, especially in and around the Deerfield Towne Center, which houses the 16-screen Regal Cinemas, a wide variety of restaurants and fun shops, such as Border's Books, Whole Foods Market and more. A car is a necessity to get around, as Mason is large and also home to some of the region's busiest thouroughfares - but many retail areas and eateries now are linked by sidewalks, so one can park and go.